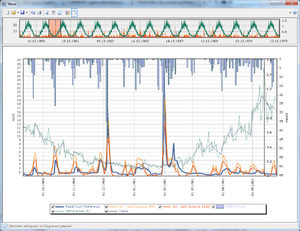 Wave is a tool for displaying, analyzing and importing and exporting time series. Use a Wave project file (*.wvp) to quickly import multiple series from multiple files at once. Drag&Drop files onto Wave to import them quickly. 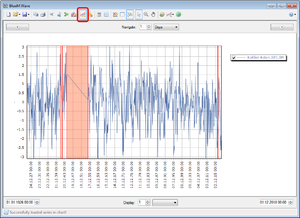 It is also possible to manually input time series, or use copy & paste from Excel. 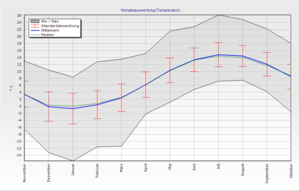 Overview: An overview chart shows you the full extent of the time series and the period currently displayed in the main diagram. 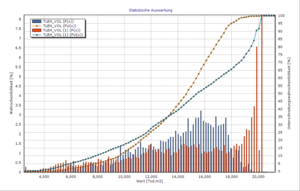 Axes: When importing time series, series are automatically assigned to different axes depending on their unit. Zoom & pan: Use the mouse to zoom or pan. Navigation bar: Use the navigation bar to set a custom display period and to navigate by a fixed time period. Quickly switch time series on and off using the check boxes in the legend. Save diagrams to the native TeeChart format (TEN-File) to preserve all data and formatting. The API is used by BlueM.Opt and BlueM.Win. "NaN", "Infinity" and "-Infinity" in import files are recognized and accepted. Unreadable values are converted to NaN during import. If a file format has a specified error value (e.g. -777 for ZRXP and UVF), then any corresponding entries are also converted to NaN. 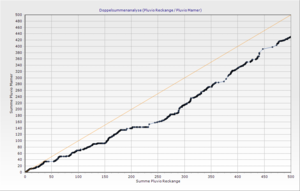 NaN values are removed before displaying a series in the chart and when performing analysis functions. Custom, user-specified values can be converted to NaN after import. NaN values can be visualized in the chart by pressing a button (see screenshot to the right). Wave can calculate and display the volume of a time series (e.g. for GoodnessOfFit analysis or in the properties window). The volume is usually calculated by simply computing the sum of all individual values of a time series (in this case it is equal to the "Sum" property). However, if a time series' unit ends with "/s" (e.g. "m³/s"), the volume is calculated by actually integrating the values over time. Which method is used to calculate the volume is always written to the log. Please refer to the Download page.